Last week, after doing some meditating on standards in grading books, I started a list of my Top 15 Comic Stories Ever. Go check it out to see how #11-#15 (the “Honorable Mentions” of my Top Ten, as it were) shook out, because here today, we are moving along to part two of that list, in which I will discuss stories ten through six. We’re going to have a lot less foreplay this week and a little more action, baby, because… uh… I don’t have a really involved lead-in to this one! No grades talk, just hit that list! There was virtually no way this wasn’t getting a mention, as it feels like Andy, Chad, and I discuss this run into the ground. We’re legally three mentions away from becoming strictly a DeMatteis/Buscema Spectacular Spider-Man themed podcast entirely. I imagine we will change our names to Ghosts Of The Frog-Men when that happens. But it’s this run and this title that is why Spider-Man is my favorite comic book character of all time. Issue #178 starts The Child Within arc that, while claiming to be the unofficial sequel to Kraven’s Last Hunt, more than holds its own as a singular great story. The six-parter follows Spidey, Vermin, and Harry Osborn as Vermin’s origin is told and Harry is sucked back into his family’s legacy of madness in becoming the Green Goblin. That arc is strong and emotional, and Sal Buscema’s pencils bring depth and life to J.M. DeMatteis’ scripts. You feel it when Harry wants more than anything to kill Peter Parker, but can’t bring himself to do it… and then still refuses Peter’s offer of friendship. It’s a loss that I didn’t expect Spider-Man to take, and as a young reader, it was a hook that made each subsequent issue appointment reading. From there, the build to issue #200–the resolution of the Harry Osborn story–is terrific. There is at least one fabulously funny issue guest-starring Frog-Man, a brutal fight against Rhino, and a follow-up multi-issue arc to conclude Vermin’s tale and bring Baron Zemo into the action. Every single issue works, they all look like a million bucks, and this will always remain the best book of my childhood, and the one that showed me what comics could be. This one surprised even me. I mentioned last week that when I started thinking what would make my Top Ten books of all time that I quickly jotted down 20-plus stories and whittled it down from there. And I honestly didn’t expect this book to make the final cut. But as I thought about it and sorted through everything… it just kept moving up, spot-by-spot, until it settled in here at the ninth position. This will always be MY Superman book. This is the Anti Zack Snyder Superman. This is a Superman who doesn’t need to TELL you that the symbol on his chest stands for hope because he’s going to SHOW you. The quick summary is the The Elite–a foursome of immensely powerful superbeings with heroic ideals but incredibly loose morality–come to Earth and start solving a lot of the world’s problems through bloodshed and violence. The human race only sees results, though, and they begin turning on Superman in favor of the more permanent solutions offered by these rogues. Superman repeatedly tries to confront The Elite on their methods, but they are too much for him and cut him off or humiliate him at every turn. Finally, after tensions have boiled over, they agree on a showdown, and Superman seemingly lets loose and murders the lot of them, leaving only their leader, Manchester Black, behind, supposedly crippled of his powers. 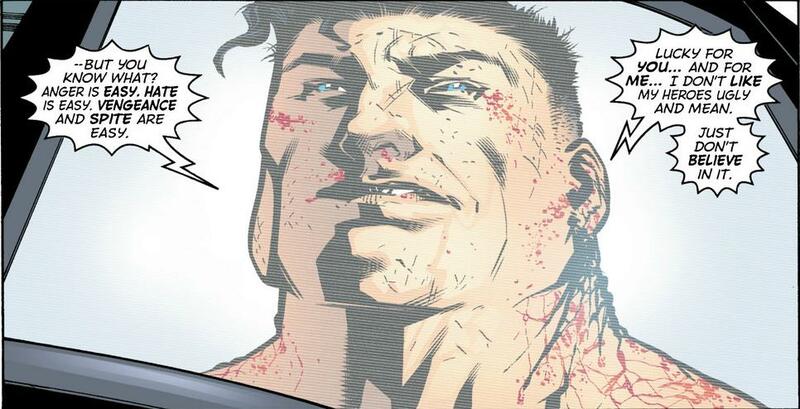 It’s then that Clark tells the world that he only made it look like he succumbed to their ideals–Black’s team was alive and subdued, and Black himself merely concussed–because he wanted to show the world that brutality is easy… and scary. And he would never resort to it because Earth deserved better. Yeah, I did an awful job at summarizing this Joe Kelly issue. It’s striking stuff, and the journey that Superman takes is why he is the most enduring character in comics history. The second, and last, manga series to appear on my list is the original Dragon Ball, and mostly what I love about this series is how much it was willing to change and the chances it took to do so. The book it starts as and the book it culminates as are almost irreconcilable. With everyone familiar to some degree or another with Dragon Ball Z–huge explosions, tons of blistering fights, and so, so much charging up during various points–Dragon Ball is oddly and delightfully different. When Akira Toriyama started the epic saga of Son Goku, the hero was just a boy, and the book was a pure comedy with some silly scuffles thrown in. He met an old pervert, fought some ineffectual monsters, and basically just goofed from place to place in a quest to help a teenage girl get a boyfriend. Over the course of 16 collected volumes, Goku slowly ages and grows from an eleven year old child to a young man by the run’s end. And the book seamlessly transitions from silly fun to dramatic action without you even realizing it is happening. It never loses its heart, however, and it remains humorous to the end. The final battle against Piccolo fulfills the book’s metamorphosis and sets up the follow up of Dragon Ball Z. And while I enjoy much of Z, the original DB just has all the whimsy and light-heartedness that these characters desperately need. Geoff Johns took over The Flash from legendary scribe Mark Waid after Waid put together a definitive run on Wally West, turning him into a hero more than worthy of Barry Allen’s mantle and giving him a layered mythology. And all Johns did was somehow better the book in almost every way. From making the classic rogues into entirely-realized characters with a code and a purpose and capabilities that make them seem like a match for the Fastest Man Alive, to introducing wonderful new characters like Fred Chyre and Jared Morillo and Hunter Zolomon, to embracing Wally’s life as a family man and showing that a married character can be as interesting as any swingin’ singles, Geoff put his stamp all over Wally and this title. 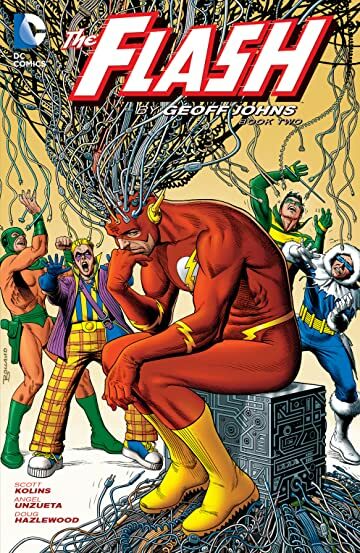 I picked issue #200 as the ending point for two reasons: first, it’s the conclusion to the Blitz storyline that built up over much of Johns’ run where Hunter Zolomon’s life fell apart around him until he became the new Zoom, and second, it’s where Scott Kolins left the book, if I am remembering right. And Kolins more than pulled his weight while working with Johns’ defining stories. His work is clean and kinetic and bright, and it has so much more detail than you think when you first look at it. He is a storyteller with his art, and combination of his work and Johns’ creates one of the finest runs in any comics’ history. Joss Whedon loves the X-Men. That has to be clear to you if you read this book. And if he DOESN’T love the X-Men, he did a hell of a job of pretending. His tenure on Astonishing X-Men draws from so many eras of X-History–from things that were established in the 70’s and 80’s by Chris Claremont, to the work of Gran Morrison that immediately preceded this, and everything in between. Whedon didn’t set out to blow everything up and make his own X-Universe; he merely wrote a love letter to the X-Men’s storied history while putting his own enduring stamp on the team. This is a book that does everything extraordinarily well. It cuts between being laugh-out-loud funny (Whedon’s Wolverine, in particular, is a constant source of humor), soul-destroyingly heart-wrenching (the very end when Kitty is lost to the team, or when she lives out the loss of her child), and action-packed (a lot of glorious battle sets… just so many). He re-established Kitty Pryde as the soul of the team and probably the greatest X-Man ever, and he also wrote a brilliant Emma Frost, rife with inner struggle. Throw in John Cassaday, who absolutely did enough in just two dozens issues to have his name mentioned with Lee, Byrne, and Silvestri as the definitive X-Men artists, and you have a book I have read over and over since it came out, It’s always fun, it always hits all the right emotional notes, and… wow, I just dig this. All I can say is, we haven’t climbed to the top of the ladder yet, chums, so… stay tuned. And until next time… take care!